Deep down in the Caribbean seafloor, around 3.1 miles (5 kilometers) is the Cayman Trough. It is the world's deepest undersea volcanic vent. Known as "black smokers", these vents eject water hot enough to melt lead. The undersea hot springs, which lie 0.5 miles (around 0.8 kilometers) deeper than any seen before, may be hotter than 450 °C and are shooting a jet of mineral-laden water more than a kilometer (0.62 miles) into the ocean above. Despite these extreme conditions, the vents are teeming with thousands of a new species of shrimp that has a light-sensing organ on its back. And having found yet more 'black smoker' vents on an undersea mountain nearby, the researchers suggest that deep-sea vents may be more widespread around the world than anyone thought. Deep under the sea, hydrothermal vents which forms black smokers are biologically more productive, often hosting complex communities fueled by the chemicals dissolved in the vent fluids. Chemosynthetic archaea form the base of the food chain, supporting diverse organisms, including giant tube worms, clams, limpets and shrimp. There are believed to be active hydrothermal vents are believed existing on Europa, a moon of Jupiter. Ancient hydrothermal vents have also been speculated to exist on Mars. Reporting in the scientific journal Nature Communications this week, a team led by marine geochemist Dr Doug Connelly at the National Oceanography Centre in Southampton and marine biologist Dr Jon Copley of the University of Southampton has revealed details of the world's deepest known 'black smoker' vents, so-called for the smoky-looking hot fluids that gush from them. During an expedition in April 2010 aboard the Royal Research Ship James Cook, the scientists used the National Oceanography Centre's robot submarine called Autosub6000 and a deep-diving vehicle, HyBIS, manufactured by the British firm, Hydro-Lek to locate and study the vents at a depth of five kilometres in the Cayman Trough, an undersea trench south of the Cayman Islands. The vents, which the team named the Beebe Vent Field after the first scientist to venture into the deep ocean, are gushing hot fluids that are unusually rich in copper, and shooting a jet of mineral-laden water four times higher into the ocean above than other deep-sea vents. Although the scientists were not able to measure the temperature of the vents directly, these two features indicate that the world's deepest known vents may be hotter than 450 ºC, according to the researchers. "These vents may be one of the few places on the planet where we can study reactions between rocks and 'supercritical' fluids at extreme temperatures and pressures," says Connelly. 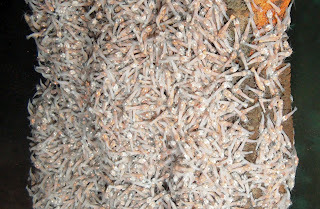 The team found a new species of pale shrimp congregating in hordes (up to 2,000 shrimp per m2) around the six-metre tall mineral spires of the vents. Lacking normal eyes, the shrimp instead have a light-sensing organ on their backs, which may help them to navigate in the faint glow of deep-sea vents. 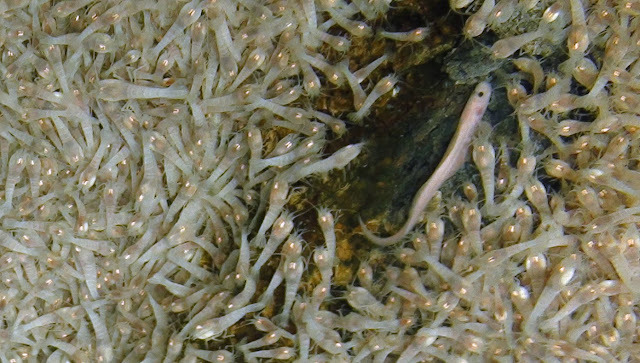 The researchers have named the shrimp Rimicaris hybisae, after the deep-sea vehicle that they used to collect them. The Cayman shrimp is related to a species called Rimicaris exoculata, found at other deep-sea vents 4,000 kilometres away on the Mid-Atlantic Ridge. Elsewhere at the Beebe Vent Field, the team saw hundreds of white-tentacled anemones lining cracks where warm water seeps from the sea bed. "Studying the creatures at these vents, and comparing them with species at other vents around the world; will help us to understand how animals disperse and evolve in the deep ocean," says Copley. The researchers also found black smoker vents on the upper slopes of an undersea mountain called Mount Dent. Mount Dent rises nearly three kilometres above the seafloor of the Cayman Trough, but its peak is still more than three kilometres beneath the waves. The mountain formed when a vast slab of rock was twisted up out of the ocean floor by the forces that pull the plates of the Earth's crust apart. "Finding black smoker vents on Mount Dent was a complete surprise," says Connelly. "Hot and acidic vents have never been seen in an area like this before, and usually we don't even look for vents in places like this." Because undersea mountains like Mount Dent may be quite common in the oceans, the discovery suggests that deep-sea vents might be more widespread around the world than previously thought. The vents on Mount Dent, which the team has named the Von Damm Vent Field to commemorate the life of geochemist Karen Von Damm, are also thronged with the new species of shrimp, along with snake-like fish, and previously unseen species of snail and a flea-like crustacean called an amphipod. "One of the big mysteries of deep-sea vents is how animals are able to disperse from vent field to vent field, crossing the apparently large distances between them," says Copley. "But maybe there are more 'stepping stones' like these out there than we realised." 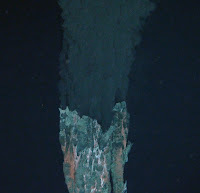 The UK expedition that revealed the vents followed a US expedition in November 2009, which detected the plumes of water from deep-sea vents in the Cayman Trough. A second US expedition is currently using a deep-diving remotely operated vehicle to investigate the vents further and the UK team also plans to return to the Cayman Trough in 2013 with Isis, the National Oceanography Centre's deep-diving remotely operated vehicle, which can work at depths of up to six kilometres. Photographs and video are (c) / credit "University of Southampton / NOC"